When watching movies and HDTV, bigger screens are better, the 50-inch Philips 50PF9830A makes it tempting to step up in size. But if the lure of extra inches isn’t enough, this set’s ultra-stylish looks are bound to grab you. The glossy black-bordered screen is flanked by silver speakers, and the TV comes with a swiveling glass stand. Aside from a big Philips logo, the front panel is super clean — control buttons, inputs, and a set of flash-media slots and USB ports are stowed away on the sides. The Philips has a built-in HDTV tuner and an up-to-date suite of video connections, including two HDMI inputs. But its most notable extra is Ambilight 2 backlighting. This feature, unique to Philips TVs, throws colored light against the wall behind the TV that shifts in hue and intensity to match the changing image onscreen (it can also be set to beam a steady white backlight). The set’s slim remote control feels substantial and has a clean layout. Along with providing cool features like one-touch access to digital snaps on a flash-memory card, it lets you cycle through video sources and select from seven display modes. But you can watch HDTV programs only in the 16:9 Widescreen mode or in Automatic, which zooms in on 4:3 pictures to fill the screen. Another feature that Philips touts is Pixel Plus 2 HD processing. I’d recommend Pixel Plus to clear up murky-looking analog channels on cable TV, but it made high-quality sources like DVD look grainy and over-enhanced, so I used the Standard mode. Like most TVs, the Philips offers a number of picture presets. Unfortunately, you can modify the settings for only one of them, and your changes apply globally to all of the inputs — a big handicap. The Constantine DVD was perfect for gauging the Philips TV’s video performance. In the opening sequence, where a scavenger discovers a knife with supernatural powers, the Philips displayed punchy contrast and a natural range of colors that captured the subtle tones of the sunbaked reddish-brown desert landscape. Brightly colored objects, like the guy’s red jacket, looked less intense than on the other sets but were still reasonably vivid. In a shot where the scavenger reaches down into a hole, the dark opening showed off the set’s ability to achieve deep, dark blacks. But the shadows crossing his face had limited detail, which made the picture look flat overall. The Philips did a great job drawing out fine detail in the high-def picture. In close-up shots of would-be assailant Sawyer confronting the vendor at his truck, I could clearly see the moisture welling up at the corner of his eyes as he started to lose his resolve. The colors were clean, and the tone of Sawyer’s face looked entirely natural. Darker scenes took their toll on the TV’s picture, however. In a subsequent bar scene, shadowy segments of the picture had a patchy, solarized quality, with light gray “islands” swirling against the slightly darker background. 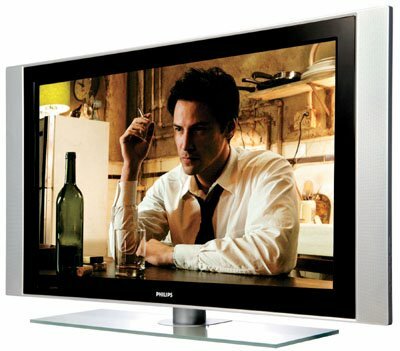 Crisp HDTV pictures, stylish looks, and a bunch of cool features like Ambilight 2 backlighting and a swiveling stand make the Philips 50PF9830A an appealing option for your flat-TV needs. The set’s overall image quality falls a solid notch below the other two models tested here, however, and the lone Personal picture preset for all of its video inputs was disappointing. But you can’t argue with the price, which is among the cheapest I’ve seen for a 50-inch plasma set. The Sanyo PDP 42WV1AS is a 42-inch, flat television. Compared to other flat TVs on the market, it is relatively inexpensive. In general, a liquid plasma display can recreate more realistic black-levels than an LCD display can. It has a 4000:1 contrast ratio, which is somewhat higher than some similarly priced TVs. The 3:2 pulldown feature of this set reduces artifacts that can occur when motion pictures are transferred to a digital format such as DVD. In view of its relatively inexpensive price, this TV has good features for the money. For example, when it comes to viewable screen size, the average price of flat televisions with similar viewable size is quite a bit more. Since this TV supports progressive scan video, you probably will want to have a progressive scan DVD player connected to it. This will produce a relatively more "flicker-free" picture, compared to what is produced with conventional DVD players and TVs. What is HDTV and why is it so important? HDTV is an entirely new system that will ultimately replace today’s existing analog "NTSC" television system. The term "HDTV" refers to a television system that can transmit, receive and display high-quality digital images. Once the DTV standard was set in 1996, the Federal government subsequently mandated a nationwide transition for the nation’s 1,600-plus television stations to move from analog to digital transmission. In order to facilitate this, the FCC allocated an additional channel to all broadcast TV stations. This second channel is dedicated for digital broadcasts and upon completion of the transition (the year 2006 or 85 percent household penetration, whichever occurs later), the original analog channel must be returned to the government. The FCC will eventually auction the analog channel spectrum. What makes HDTV better than today’s television? HDTV offers incredibly detailed, life-like picture quality with up to five times the sharpness of today’s television along with digital surround sound capability and a widescreen format. Is my current TV obsolete? No, analog televisions will continue to receive analog broadcasts at least through 2006, and probably longer. After that, consumers will be able to connect an inexpensive receiver to their existing TV to decode TV broadcast signals, just not in high-definition. Of course, current televisions will continue to work with cable, satellite, VCRs, DVD players, camcorders, video game consoles and other devices for many years. 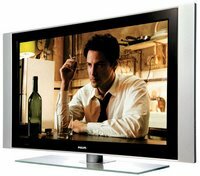 What can I watch in HDTV? The great news for consumers is that Hollywood is creating more and more digital programming at the highest levels of resolution and sound quality.